Deploying a Lean Six Sigma program is like climbing a mountain without ropes: some minor stumbles on the way are bound to happen, but an outright failure can only happen once. You wouldn’t show up to a challenging climb with only superficial knowledge of climbing – rather, you would learn the most effective techniques and strategies from those who are already highly successful. Otherwise, you risk finding yourself in a situation where the only way out is to go down, not up, and end up trying to at least make sure the trip down is controlled and not freefall. If you want to get advice from an experienced mountain climber, it is easy enough to go hang out around equipment shops and mountain bases to encounter them. But Lean Six Sigma Deployment leaders don’t congregate in such places – a quick FMEA has them avoiding mountain climbing without ropes after all – so finding a group to get input from is not so easy. 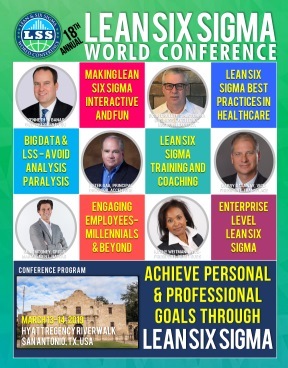 Fortunately the Lean and Six Sigma World Conference is bringing together a team of experienced leaders to share their experiences and knowledge in a panel setting! The panel will enable audience members to get a variety of thoughts about common questions and more confidently build a path forward in their own programs. Every organization has its own culture, challenges, values, and engagement, and thus there is no one size-fits-all approach to an improvement initiative. However, by bringing together a panel of experts from across multiple industries and environments, participants will better understand not just WHAT each has done to be successful, but WHY and whether that same situation applies to their own or not. Successful deployment of a Lean Six Sigma program is very much like climbing a mountain: some initial gains are going to be easy but the true peak – a culture of customer-driven, data-based decision-making where waste is constantly sought out and removed – is far from easy to reach. If it was, that’s how everyone would be doing business. But by listening to those who have experience climbing towards that peak and filling in your own knowledge gaps and alleviating your concerns, you will be prepared to move towards the summit confidently!